David James’ trip report is here. Well, here I was again, planning another pelagic. Booked in a week and a bit out, and as the time approached, I was becoming slightly more and more concerned about the weather forecast. On the 10/10, a system of 3 moderate low pressure cells were forming up, with one bigger one off towards NZ. A big front passed through on the Thursday/Friday, with accompanying big seas and wind. This led to the departure time being pushed back to 9am instead of the usual 7am, but we still had a pretty bouncy trip, with 3ish metre swell and 2-3 meter seas – yeeeeeeehaw! I don’t mind big seas as much as I thought I would, but I don’t like it anywhere near as much when the boat is jammed full of people, and there’s big seas. Particularly when it seems that a not insignificant amount of participants hadn’t taken sea-sickness medication, or really didn’t like big seas. I conservatively estimate that about 1/3 of the participants were spewing at some point, and another 1/3 were very green. The personal highlight was when the back of the boat smelt like a teen new years party at 6am the morning after, due to people vomiting all around. While that tested my resolve, I am still yet to be sick on a boat. And that’s enough vomit talk for this post. Birds! The plus side of sea birding following a big blow is that there’s usually something special around, and this trip maintained that, giving us repeated views of a fairly close approaching Cooks Petrel (bird #526 on the life list). 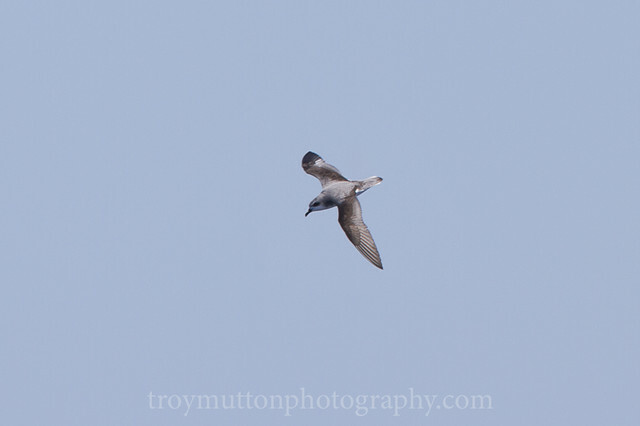 Apologies for the dubious nature of some of those shots – pitching boat + fast flying bird = dodgy photos. I haven’t done any processing to them, they’re just 100% crops of the originals converted from raw. Other sterling birds seen were plenty of White-faced and Wilson’s Storm Petrel’s (we had at one point 5 of the former and 3 of the latter around the boat), more albatross than you could shake a stick at, and a few very close approaching Sooty Shearwaters. 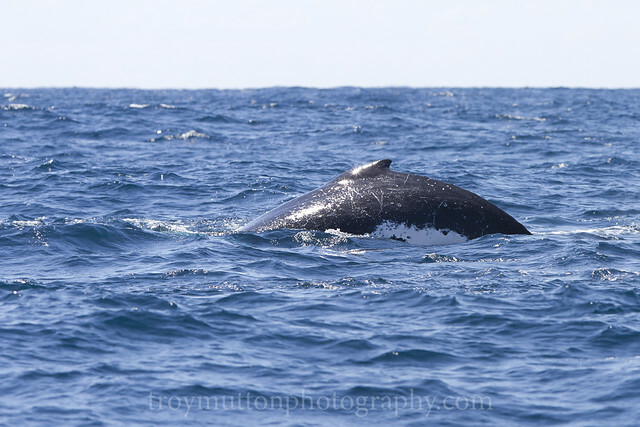 In terms of sea monsters, we had some close sightings of Humpback Whales, a couple of dolphins, and a couple of close approaches by Ocean Sunfish. All in all, a great day out on the ocean. I’ll definitely be back. I reckon there’s a few people who were on that boat that will never go on another boat that leaves the heads, and if I’d been sick for 10 hours, I probably wouldn’t even venture on the Manly Ferry on a calm day. 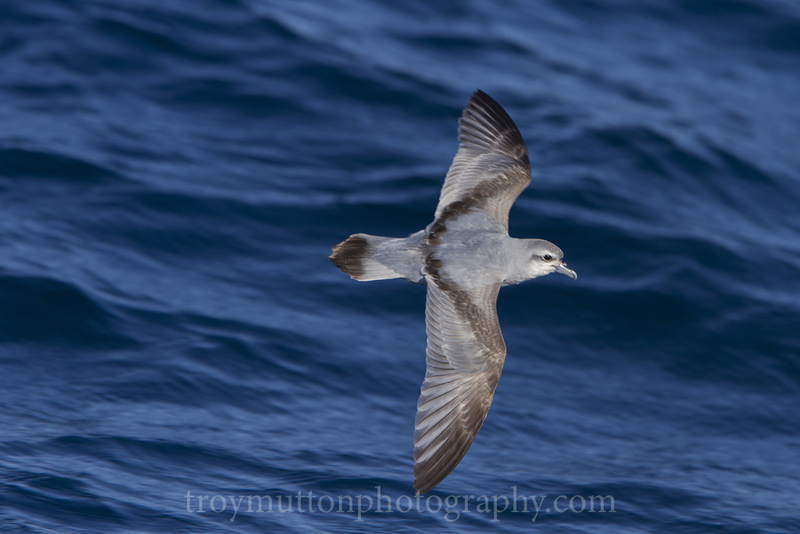 This entry was posted in 2012, Birding, Sydney Pelagic on October 26, 2012 by admin. Spent a pleasant enough spring morning on Sunday doing the Wattamolla to Curracurrang Cove walk at the Royal NP this morning – further training for my trip to Bowra in … not very long at all! The highlights were several – a pod of around 30 Bottlenosed Dolphin, Tawny Crowned Honeyeaters a-plenty, a Peregrine Falcon buzzing a small group of feeding Yellow-tailed Black Cockatoos, and around 30 other bird species. Not much in the way of landscape shots, as it appears that half of Sydney was also enjoying the sunshine, but I hope you enjoy this Tawny-crowned Honeyeater sans right foot. I’ll upload some more if I get a chance to process them before I go away. This entry was posted in 2012, Birding, NSW, Royal National Park on September 9, 2012 by admin. Royal National Park heath, with Little Marley beach on the horizon. With some lovely late winter sunshine and some nice weather, we decided to go down to the Royal National Park and do the walk to Deer Pool. Highlights were the wildflowers in full show, and bird wise was a Little Eagle, and a Brown Goshawk (record shots below). Little Eagle, top and bottom – even from >1km away, he was looking at us. All in all a lovely walk, and one I can recommend to everyone. I’ll upload some more images later on. This entry was posted in 2012, Birding, NSW, Royal National Park on August 29, 2012 by admin. As promised in my post after the May trip, I was out on the July one. This was possibly one of the nicest days out at sea – it was a beautiful warm, clear, sunny and fairly flat day out. Only 1 person was sick that I saw, and yet again, it wasn’t me. I also brought my mum and dad out with me on this trip, as a significant birthday gift for my mum. Some of my dads shots will be linked to from here later on. As it was fairly calm, I was hopeful for some sea-monster sightings, and wasn’t disappointed. We saw Humpback Whale, Southern Right Whale, Dwarf Minke Whale, Shortfin Mako Shark, Short-beaked Common Dolphin, and False Killer Whale was also seen, but not by me. Bird was it was down on numbers and diversity, but we managed Little Shearwater, White-faced Storm-petrel and some juvenile albatross, one of which is the subject of a seperate post here. If anyone out there reading this cares to look at the post about the possible Grey-headed Albatross and offer an opinion, that’d be great! 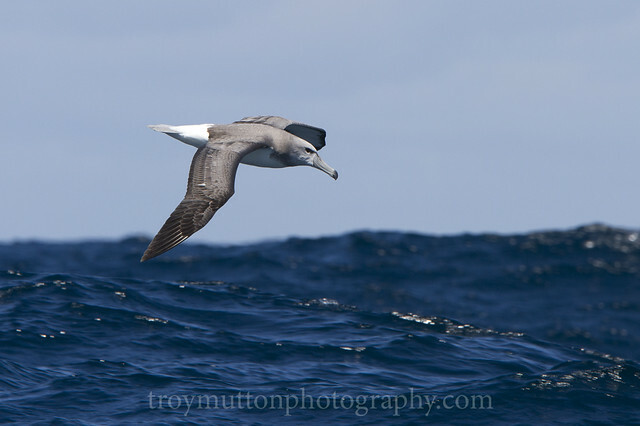 This entry was posted in 2012, Birding, Sydney Pelagic on July 17, 2012 by admin. Ok – it’s not a Grey-headed, and Nikolas has posted why here. That’s the sort of thing I wanted to hear – a reasoned explanation why. 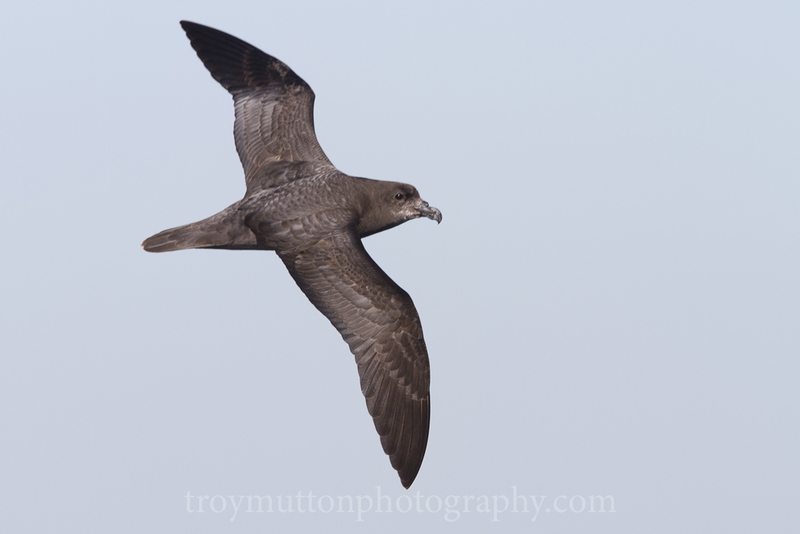 This is a more detailed post about the juvenile albatross that was seen and photographed on the July Sydney pelagic. At the time, consensus seemed to be that it was just a very dark hooded Black-browed Albatross, but the white cheeks were something of interest. I’ve been going through my photos today, and I’m all but convinced that it is now a Grey-headed Albatross, or that I can’t interpret plumage descriptions and this is just a very dark hooded Black-browed Albatross, or that there’s loads of incorrect ID’s out there on the internet (well, we know that this last part is true, but anyway…). This shot is almost identical to the bird seen yesterday, and at a similar time of year – yesterday’s bird has a slightly whiter chin, and the cheek patch goes back a little bit further. This discussion, and in particular the head of the second bird in the thread is quite similar, and while the underwing doesn’t match yesterday’s bird, the ones further down that are mentioned in Nikolas’ post with photos that Raja took and was ID’d as a 2nd year bird certainly have a similar underwing. The top left and top right bird in Nikolas’ post is all but identical, I would say. HANZAB (vol. 1A, pp. 319-320) describes the juvenile plumage of Grey-headed Albatross and states that the cheeks are the first to go white, and has a description of the neck colouring consistent with this bird. Re: Black-browed Albatross, no mention is made of cheeks going white prior to the rest of the head plumage, which his bird definitely has. On p 320, it states that eye colour is as adult – “dark brown”, and that can be seen in this bird. 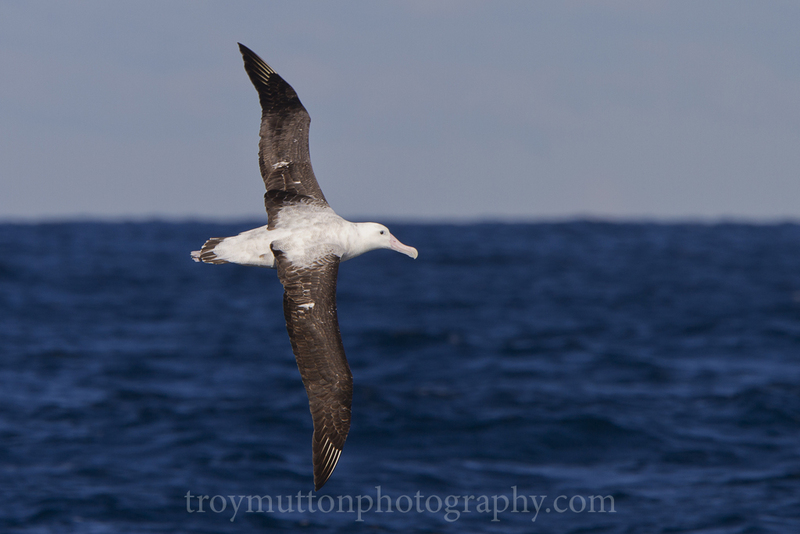 Contrast this with Black-browed Albatross on p. 298 which states that the eye in juveniles is black-brown. I call this eye light-brown, but colour judgement is always a matter of perception – it may be a light based issue – it was a sunny bright day at sea. The bill description for GHA is “mostly medium to dark brown-grey, contrasting with grey-black ungues” which this bird has. For BBA, the description (p. 298) is “culminicorn and ungues black-brown… rest of bill, dark olive-brown”. The image of GHA on page 305, plate 20, looks pretty good for a match with this bird – I accept that the plate image has a darker hood than this bird. Shirihai doesn’t go into extensive discussion about seperating juvenile/immature GHA’s from similar species, but in the top left image on page 125, does mention that when plumage is “still fresh, the grey hood appears more complete (often with characteristic pale fore-cheek area) and easily eliminates juv Black-browed/Campbell Albatross. … unlike later note uniform dark bill.” – which is what this individual doesn’t have – a uniform dark bill. Harrison doesn’t offer too much to the discussion apart from stating that on “average: juveniles show a darker head, breast band and underwing, but there is some overlap (especially in D.m. impavida underwing). Most reliable character at this age is bill colour: Grey-headed fledge with wholly blackish bills, Black-browed with greyish or horn-coloured bills, tipped black)” (Harrison, 1983, p 231). As the discussion above and HANZAB mention, the bill colour isn’t an entirely complete ID factor. Onley and Schofield state that juvenile GHA’s have a “hood paler than adult[s], usually with whitish cheeks. … Underwing mostly black, with slightly pler grey central panel to inner wing. Bill dark blackish-grey with dark tip.” (Onley & Schofield, 2007, p. 138). For Black-browed Albatross, no mention is made of a white cheek as part of the moulting/aging sequence. This page has all the shots of the bird I’ve got here, and some others, at a larger size. I’ve done nothing to these images – they’re straight off the camera, converted from RAW to JPG and resized – nothing else has been done. I can provide the original images if they’ll help the discussion. I am entirely open to this bird not being a Grey-headed Albatross and just being a particularly dark-headed Black-browed Albatross – as noted in many places on the net, these are difficult birds to separate at these ages. If this is your belief, please give reasons – I’m just trying to learn more about differentiating juvenile and immature albatross. Harrison, P. (1983). Seabirds, an identification guide. Beckenham, Kent: Croom Helm. Onley, D., & Scofield, P. (2007). Albatrosses, petrels, and shearwaters of the world Princeton, NJ: Princeton University Press. Shirihai, H. (2008). The Complete Guide to Antarctic Wildlife (2nd ed.). London: A&C Black. Steele, W. K., Davies, S. J. J. F., Ambrose, S. J., Marchant, S., Higgins, P. J., & Peter, J. M. (1990). Handbook of Australian, New Zealand & Antarctic birds. Melbourne: Oxford University Press. 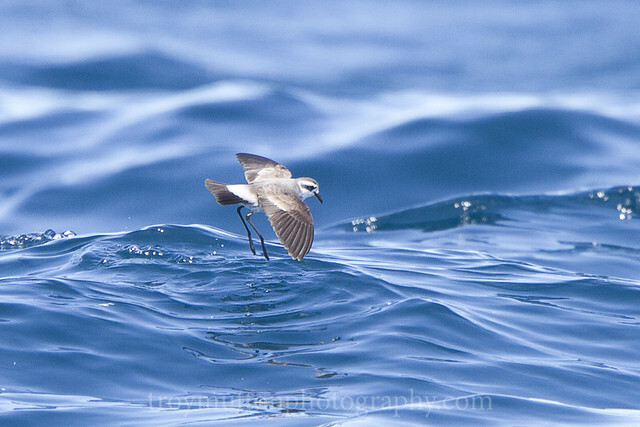 This entry was posted in 2012, Birding, ID help, Sydney Pelagic on July 15, 2012 by admin.